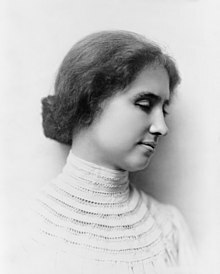 ↑ "HELEN KELLER GOES TO COLLEGE - Deaf, Dumb and Blind Girl Now Studying at Radcliffe - Passes Her Examination with Honors Although She Had Many Obstacles to Overcome During Her Years of Preparation - At Home in the Foreign Languages - Work in Translation Brilliant - Enjoys the Plays of Shakspeare (sic) - Is Apt in Quotations". The Chicago Tribune: 16. October 13, 1900.